Greece (Hellas) is a country in Southern Europe, with extensive coastlines and islands in the Aegean, Ionian, and Mediterranean Seas. 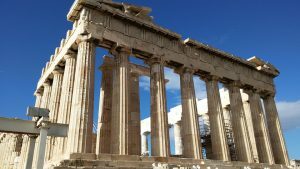 Greece has an ancient culture that has had a significant influence on the arts, language, philosophy, politics, and sports of western society, including the genres of comedy and drama, western alphabets, Platonic ideals and the Socratic method, democracies and republics, and the Olympics. Furthermore it's a geographically appealing place to visit, with a mountainous mainland and idyllic island beaches. View more photos on Greece. From site JenReviews.com you can read a list of beautiful places (to view) and activity (to do) in the Greece.